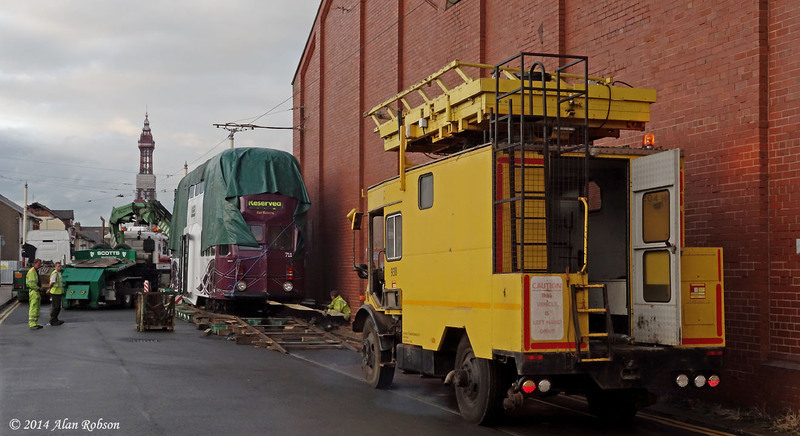 Further to the news item showing Balloon 711 and Box Car 40 en-route in Preston while being transported back to Blackpool after being on loan to the National Tramway Museum, here are a few views of the trams being unloaded at their destination. 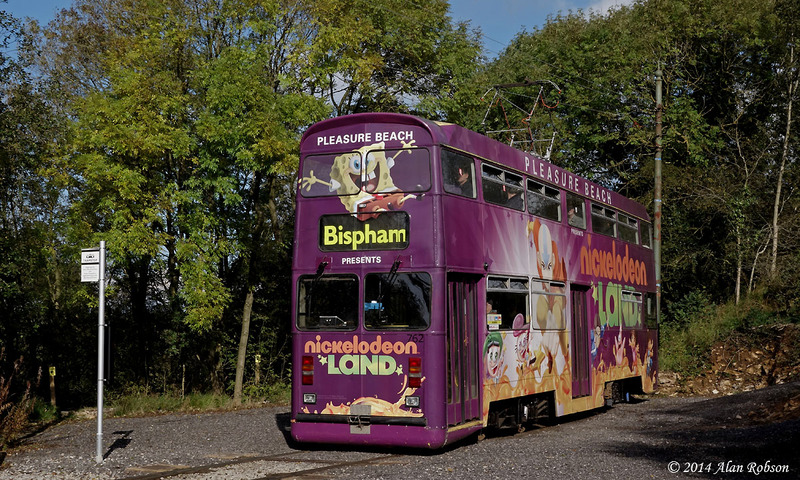 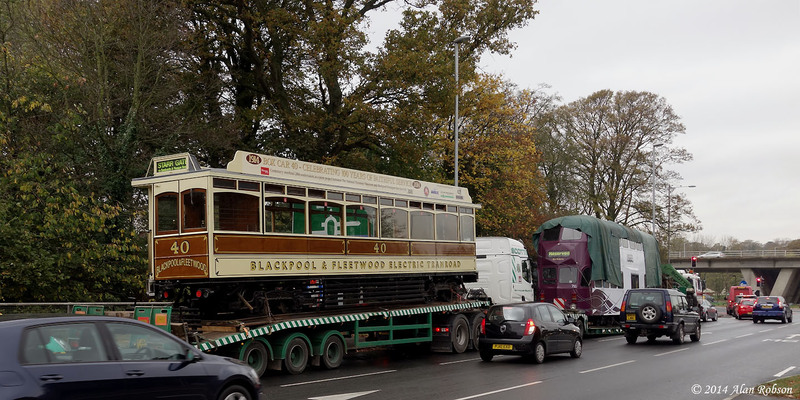 Blackpool Balloon 711 and Blackpool & Fleetwood Box Car 40 returned to Blackpool from their loan period at the National Tramway Museum on 30th October. 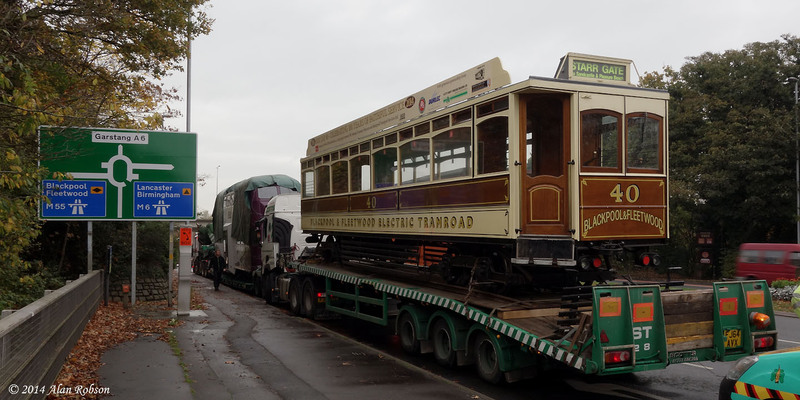 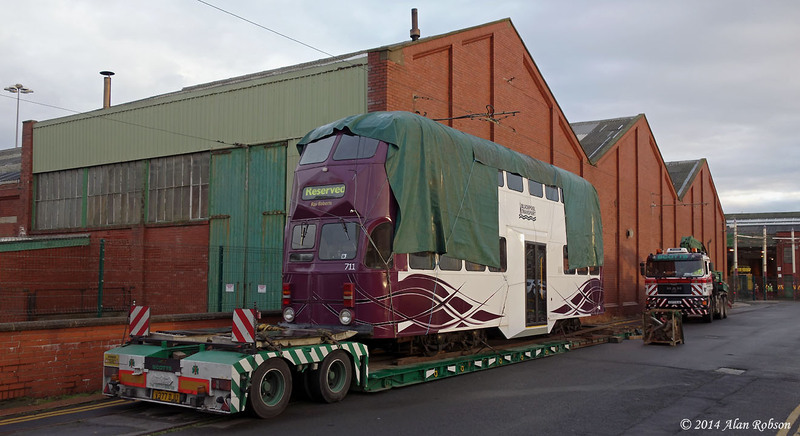 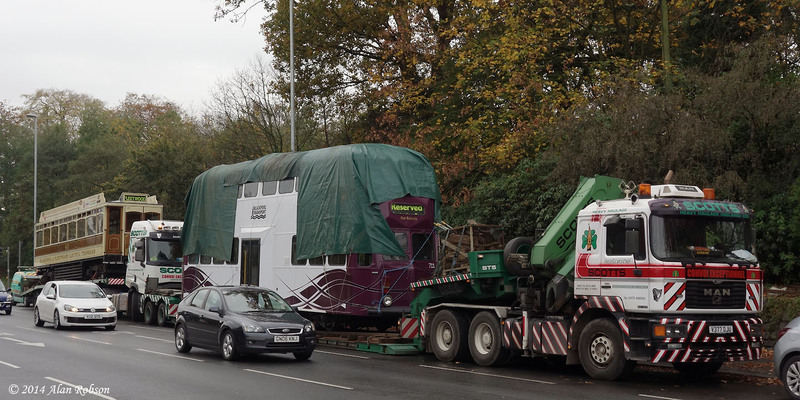 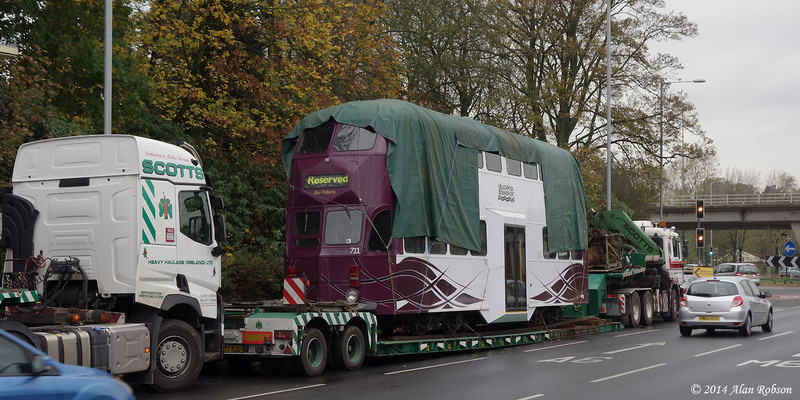 What should have been a smooth journey began with the trams being loaded onto two of Scotts trailers at Crich on 29th August, the plan being to travel up to Blackpool on the same day. 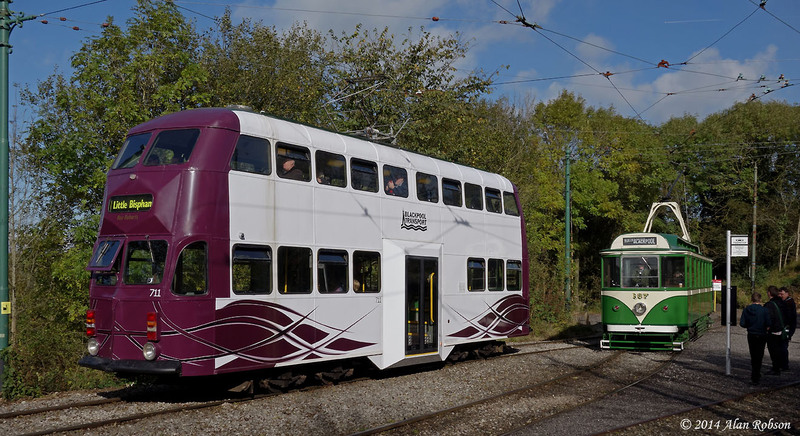 Unfortunately the trams were delayed for many hours, a mere 20 miles away from their destination, near the Broughton junction of the M55 motorway at Preston. 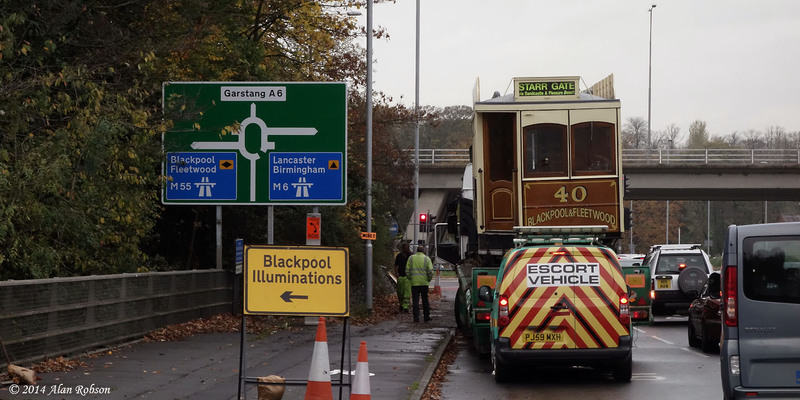 Here are a few photos of the trams blocking one lane of the main northbound A6 road at Preston, adjacent to the M55 motorway junction. 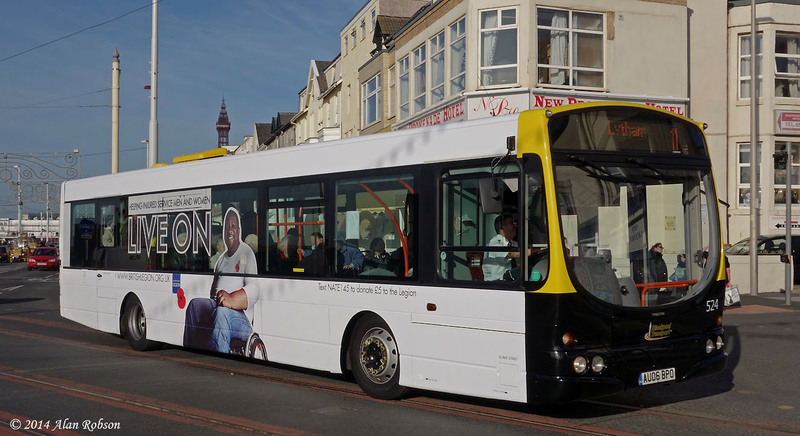 Blackpool Transport 524, a Volvo B7RLE with Wright Eclipse single deck bodywork, has been outshopped in an new overall advert scheme. 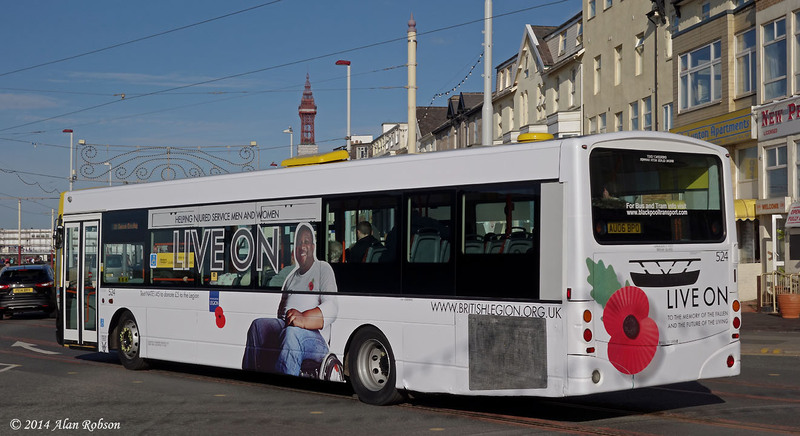 The advert on 524 is for the British Legion poppy appeal, Dennis Trident 301 has also received a similar style advert for the British Legion. 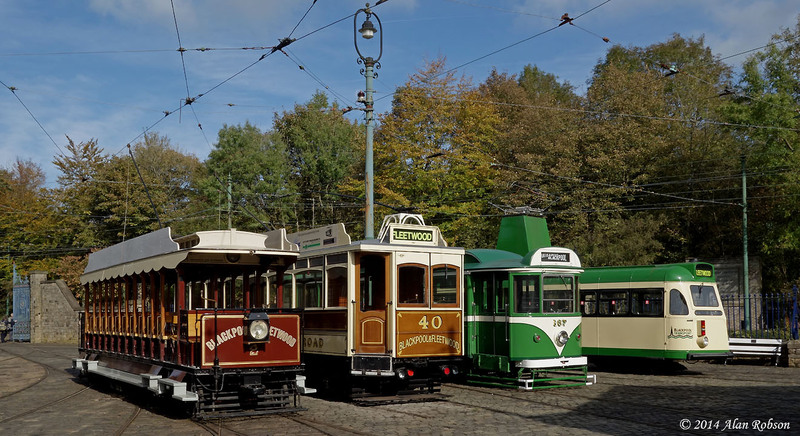 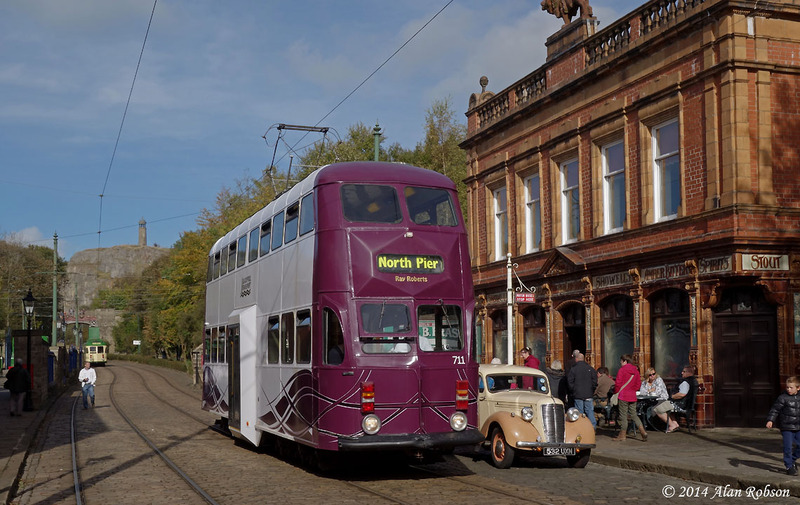 A selection of photographs of the trams running in service during the Blackpool running day at the National Tramway Museum at Crich on Sunday 12th October. 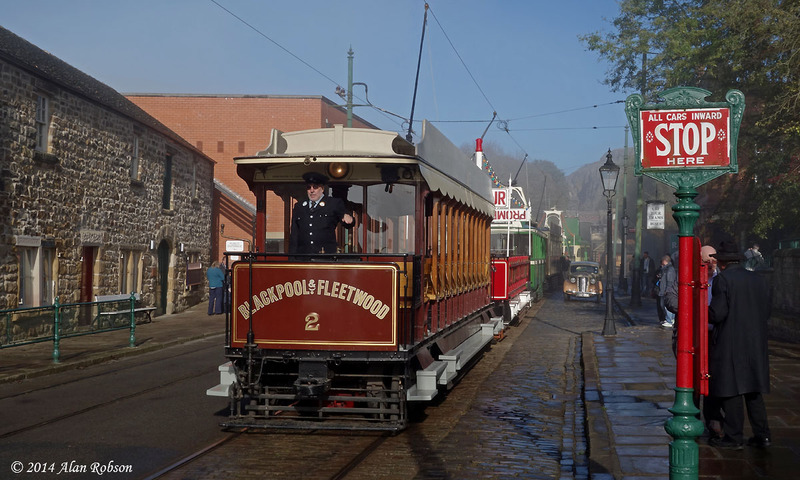 The Blackpool running day at the National Tramway Museum at Crich on Sunday 12th October saw several line-ups of Blackpool trams take place on the depot track fan. 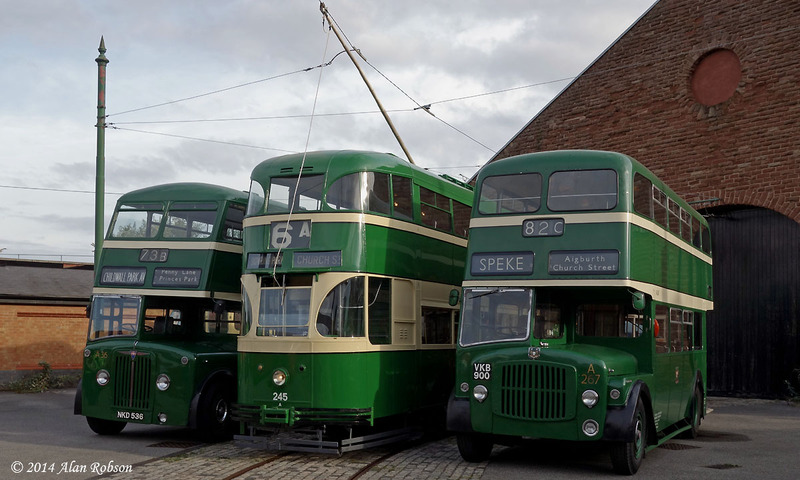 The first line-up of the day "The Double Deck Fleet" took place around 11:00, and consisted of Standards 40 and 49, Balloon 711 and Jubilee 762. 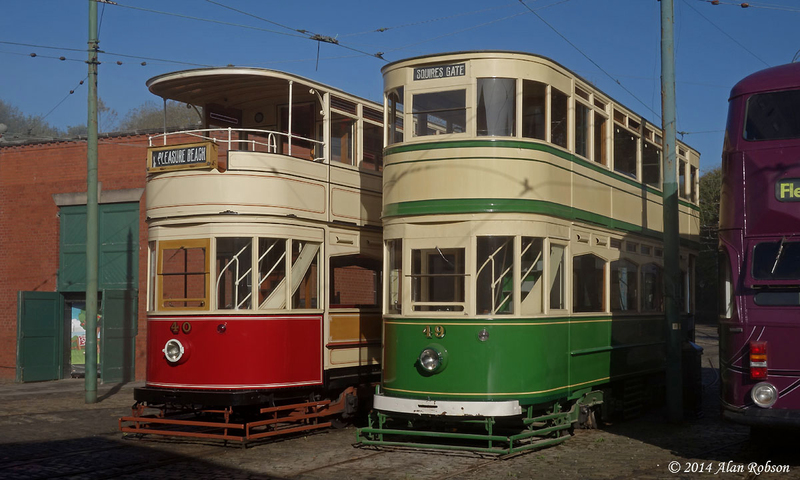 "The Tramroad Fleet" was the second line-up, which was assembled shortly after 13:00, and comprised of Blackpool & Fleetwood Rack 2 and Box 40, Pantograph 167 and Brush Car 630. 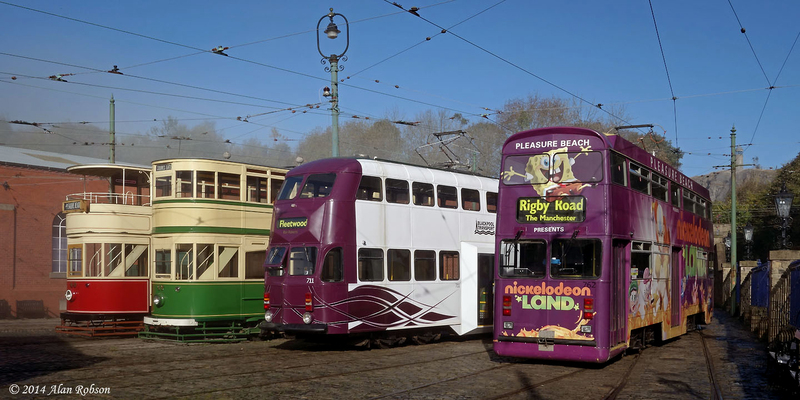 The last line-up "The Seaside Fleet" gathered at 14:15, and contained Blackpool & Fleetwood Rack 2, Toastrack 166 and Luxury Toastrack 236. 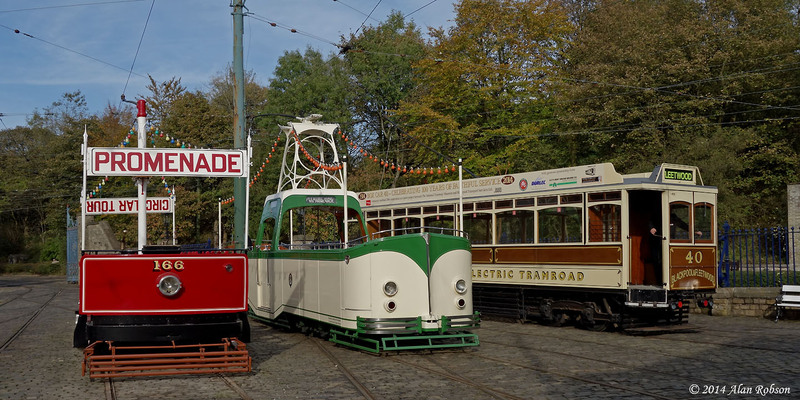 During all these photo calls Standard 49 remained on the depot fan, and could be included in the group shots with the other trams that were being assembled at various times throughout the day. 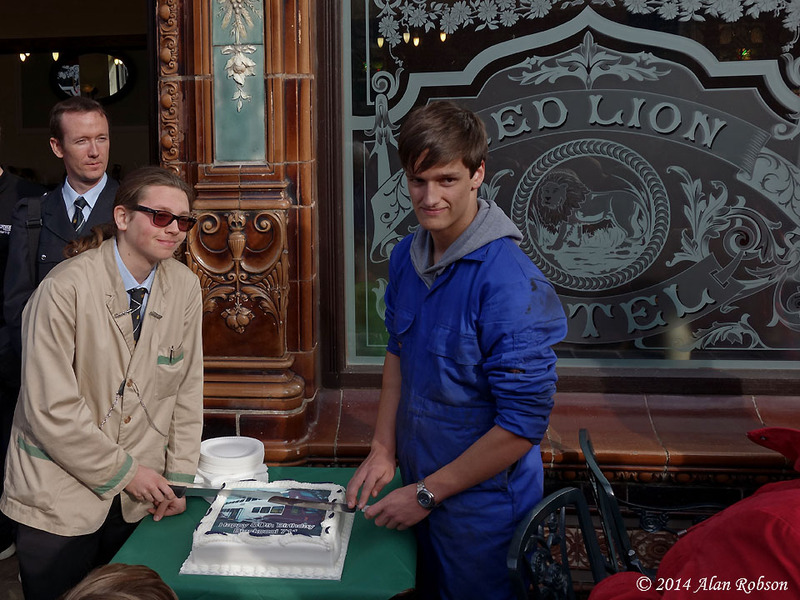 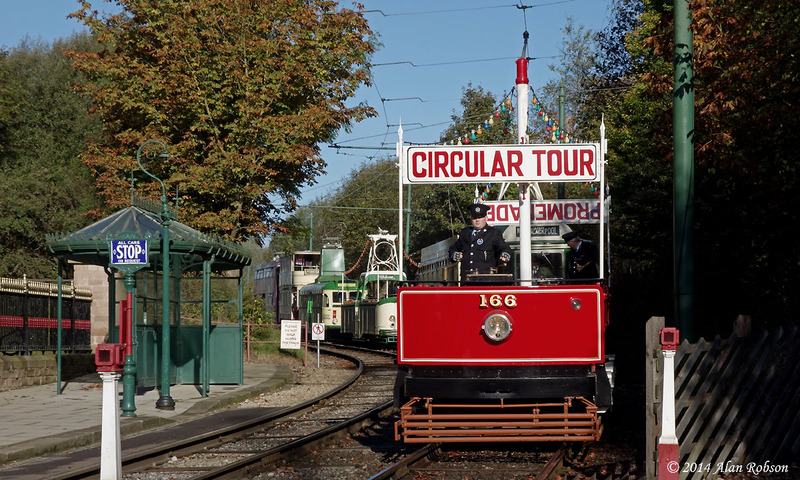 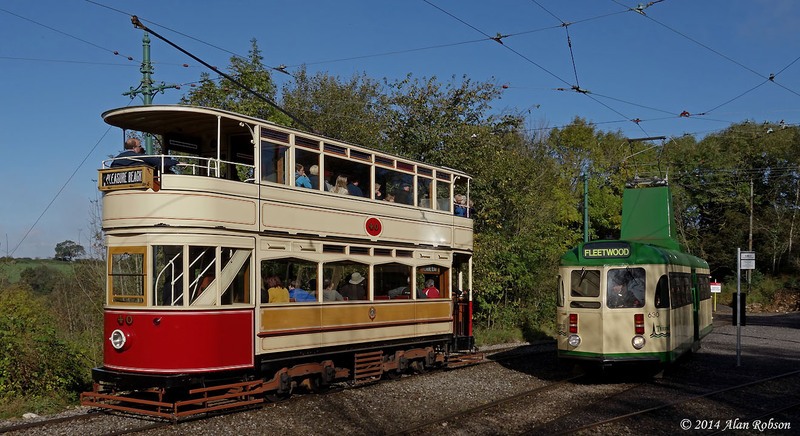 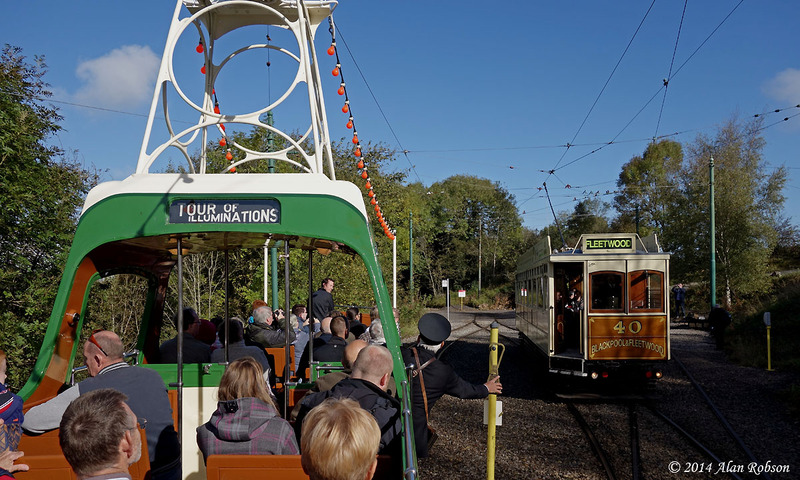 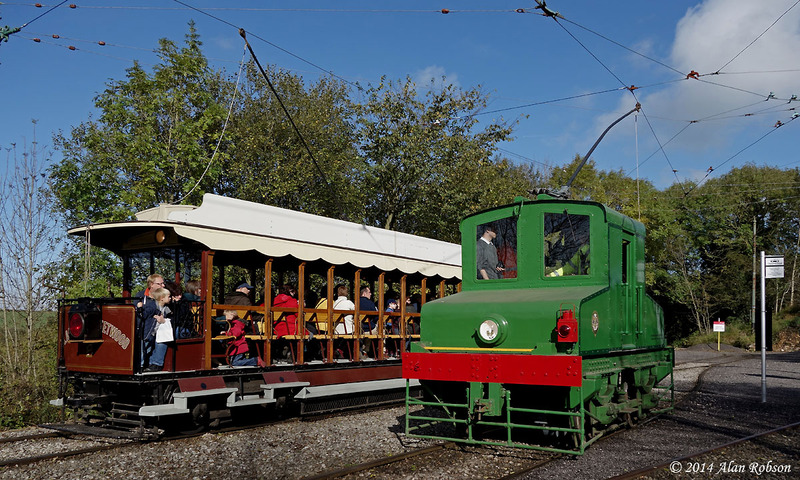 The National Tramway Museum at Crich organised a special event on Sunday 12th October to commemorate the 80th birthday of Blackpool Balloon 711, which had been on loan to the museum for the 2014 season. 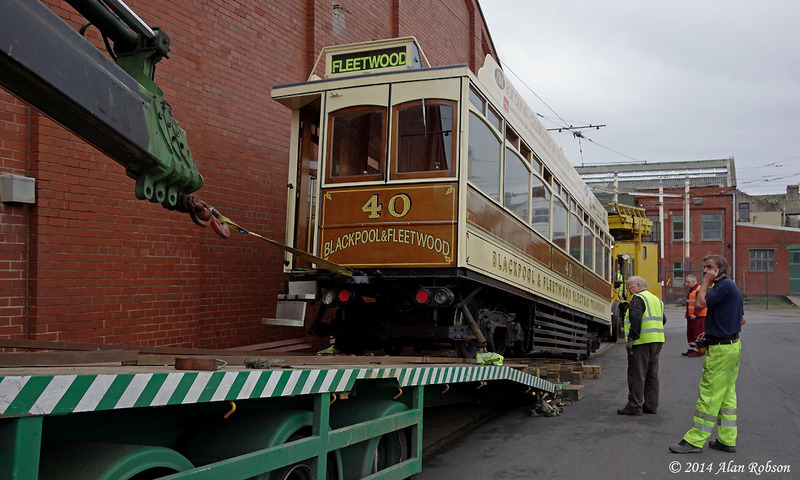 The event took the form of a Blackpool running day, with all the serviceable Blackpool trams being pressed into passenger service. 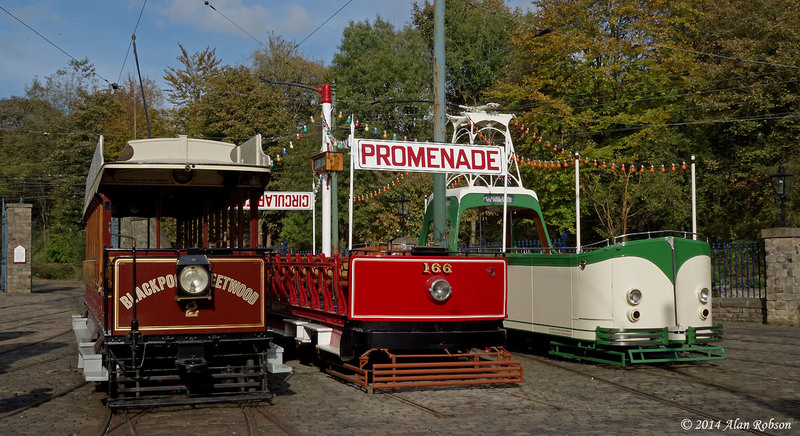 The day started out with a cavalcade of trams which formed at the museum entrance near to the bandstand, consisting of Balloon 711, Rack 2, Toastrack 166, Pantograph 167, Box 40, Boat 236, Brush 630, Standard 40 and Jubilee 762. 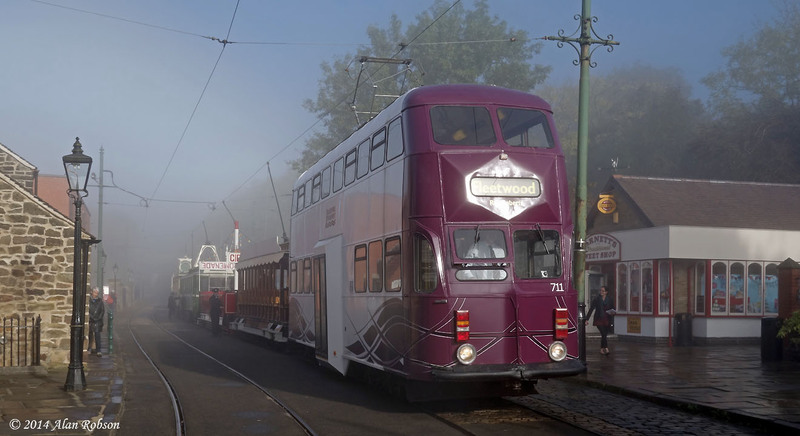 There was widespread fog across the country during the morning, and Crich was no exception with bright sunshine and blue skies near the bandstand, yet only a few yards away near the depot the tramway was shrouded in mist! 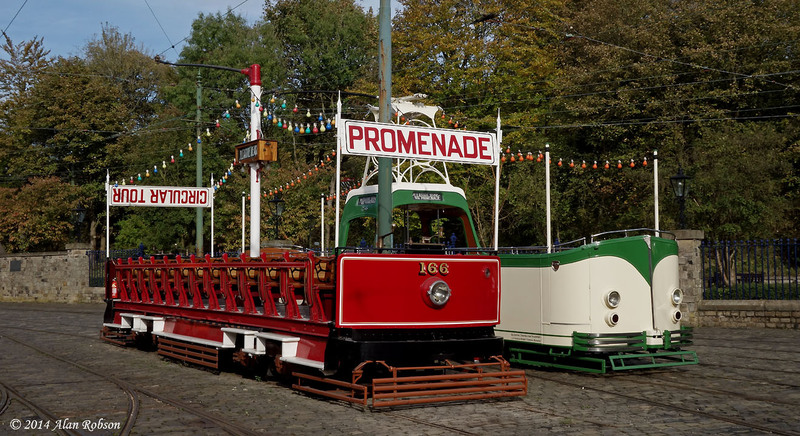 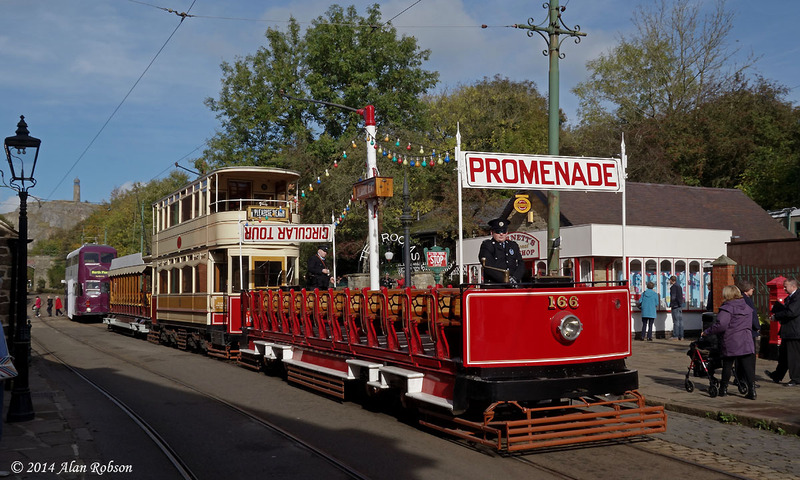 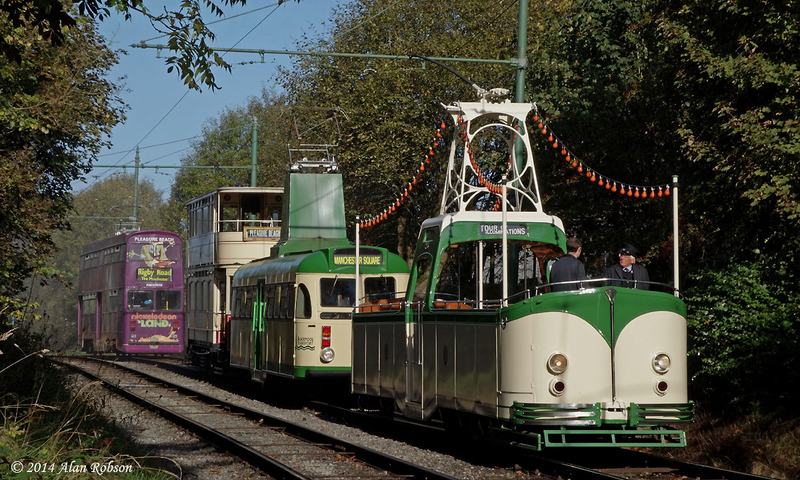 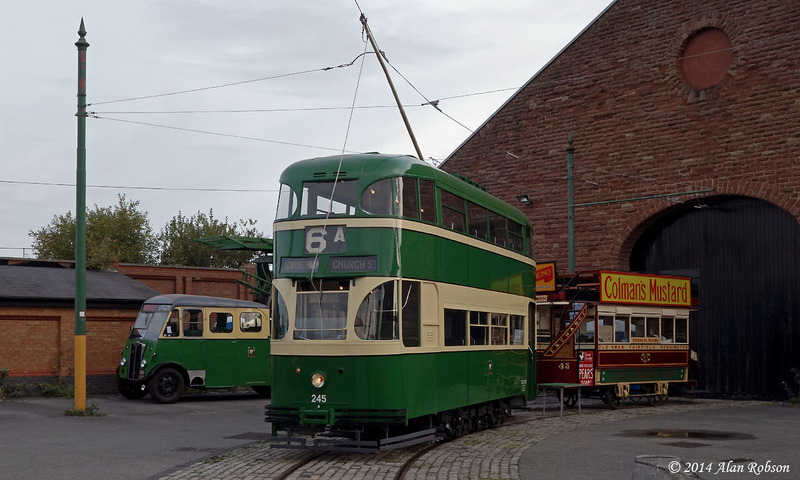 The annual Wirral Bus and Tram Show at Birkenhead on 5th October gave an opportunity for the Merseyside Tramway Preservation Society to show the progress that they have made with the restoration of Liverpool Baby Grand tram 245. 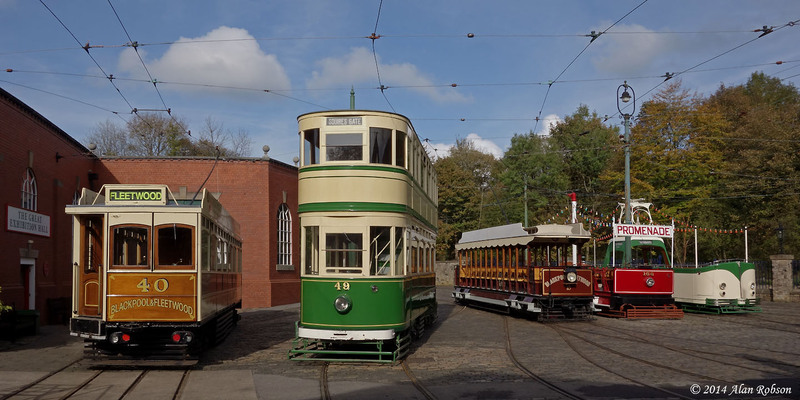 The tram was built at the Edge Lane Works of Liverpool Corporation Tramways in 1938, and remained in service until the tram system closed down in September 1957. 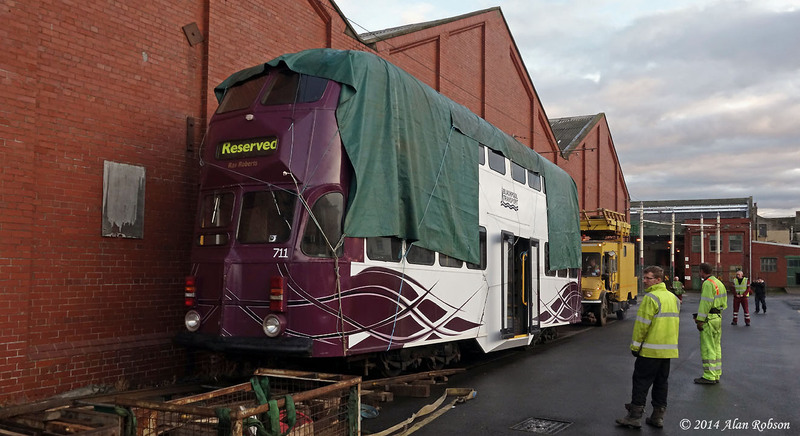 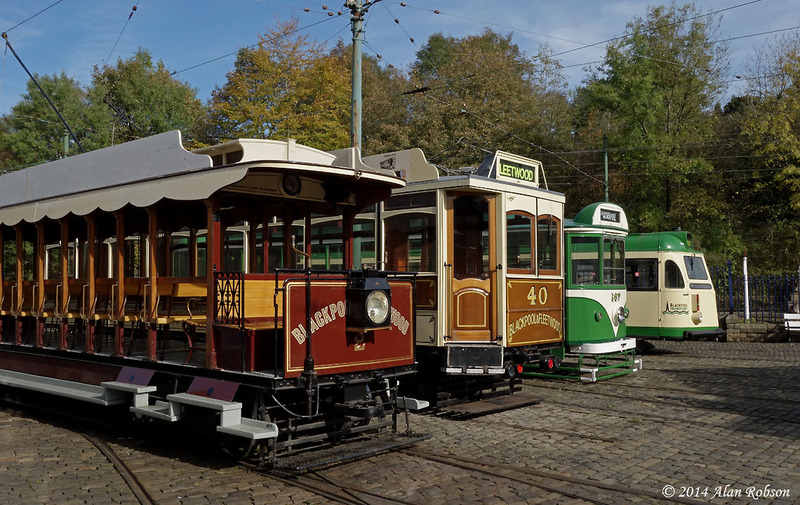 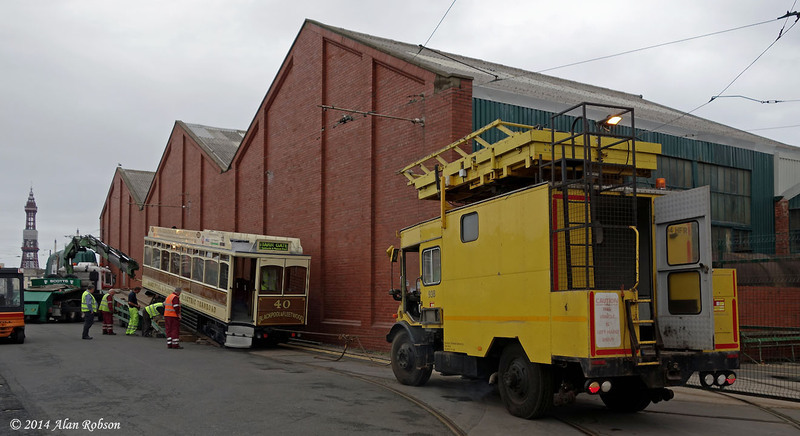 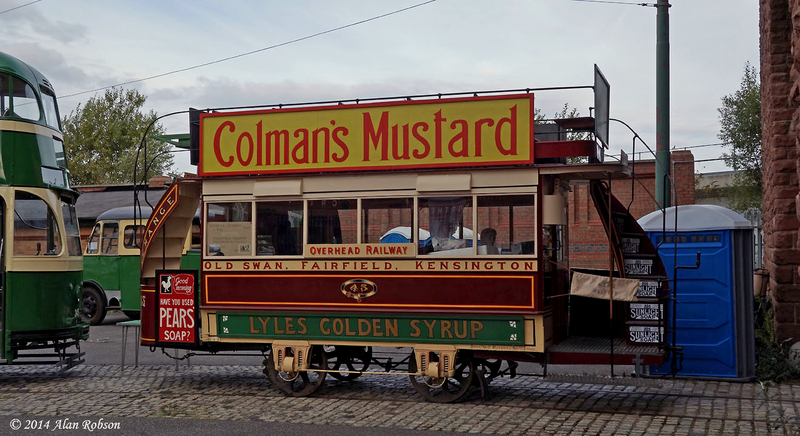 After having been stored at various locations over the intervening years, a decision was made by National Museums Liverpool (NML) to move 245 to the Birkenhead Heritage Tramway where it could be restored to operational condition again by the MTPS. 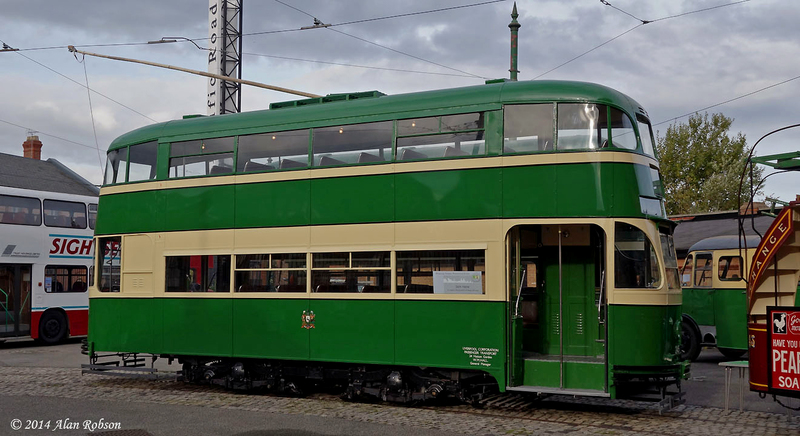 The tram was duly moved to the Taylor Street depot of the MTPS at Birkenhead in 2006, since when the tram has been cosmetically restored to its former glory. 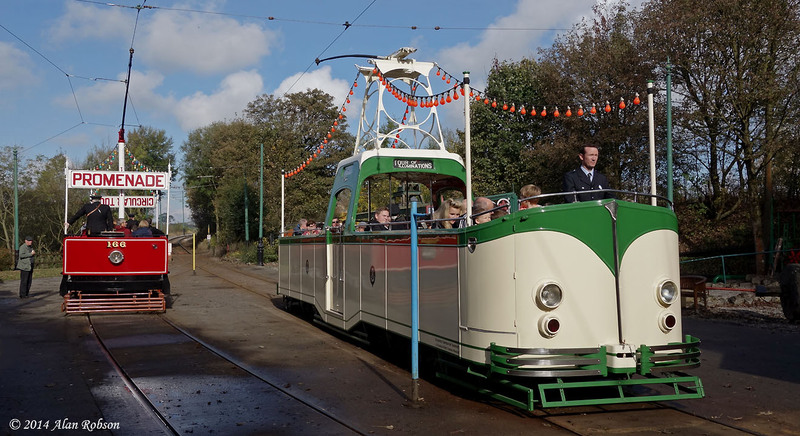 Further work still remains to be done on 245 before it can be used in passenger service on the Wirral Tramway. 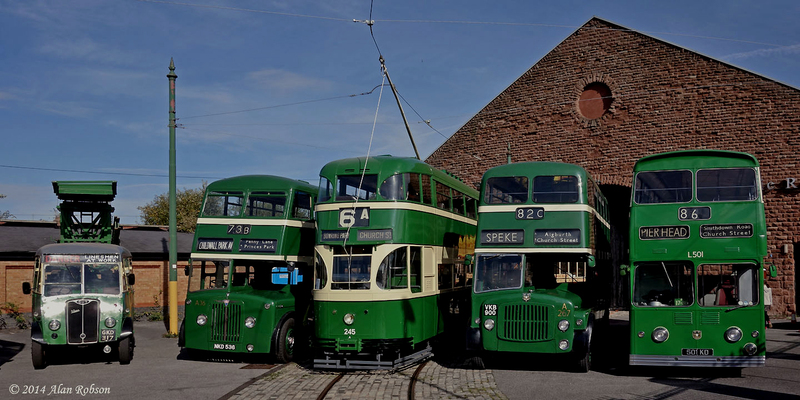 A magnificent line up of former Liverpool Corporation Transport vehicles were assembled together for display in front of the Pacific Road building, comprising of 1946 Guy Vixen tower wagon GKD 317, 1953 Crossley bodied AEC Regent III A36, 1938 Baby Grand 245, 1957 MCW bodied AEC Regent V A267 and 1962 Leyland Atlantean L501. 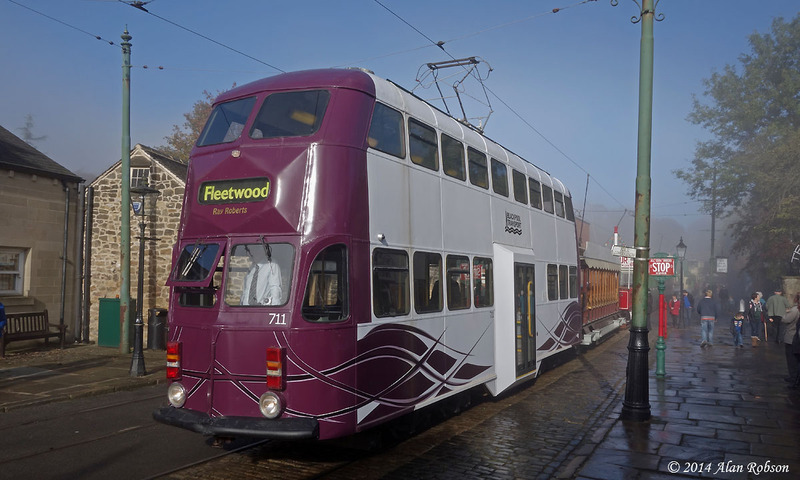 All the vehicles in the line up were contemporary with Baby Grand 245 apart from the Leyland Atlantean, which was delivered five years after the tram system closed. 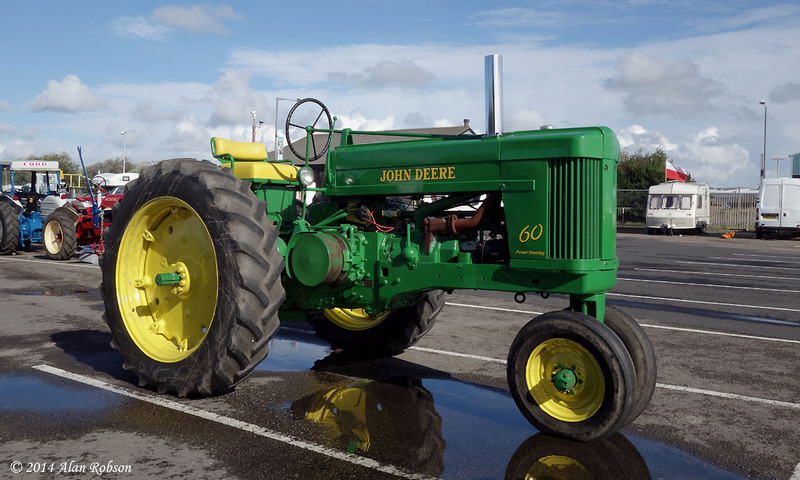 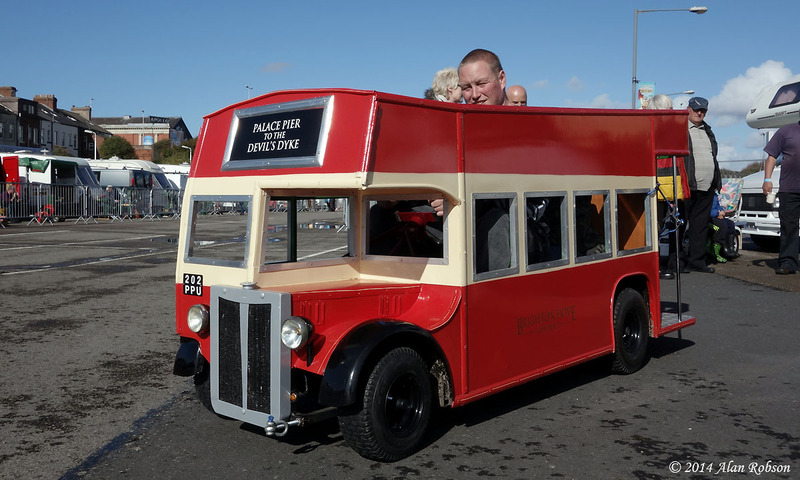 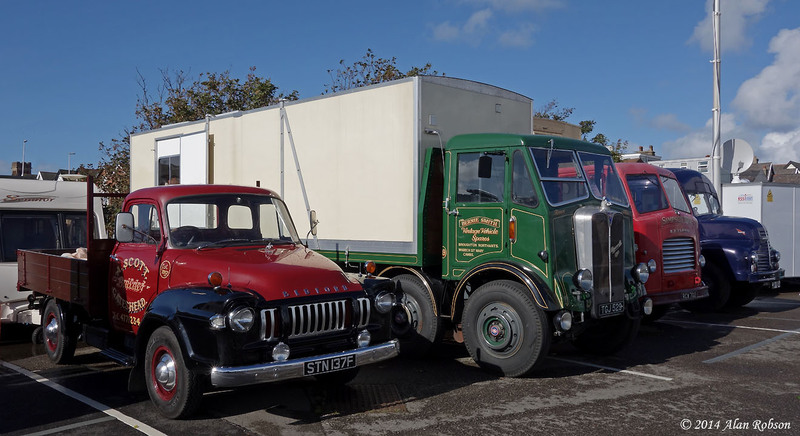 The weekend of 4th and 5th October saw the debut of a new event on the rally scene, when the Blackpool Steam and Vintage Vehicle Rally was held on Blackpool South Car Park. 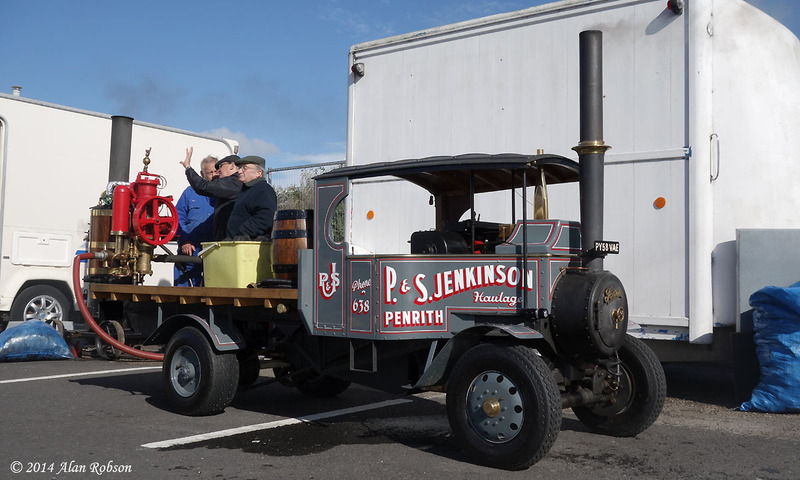 The first day of the rally seemed to be fairly poorly attended given the amount of work that that obviously gone into the organisation of the event, which also included a travelling fair. 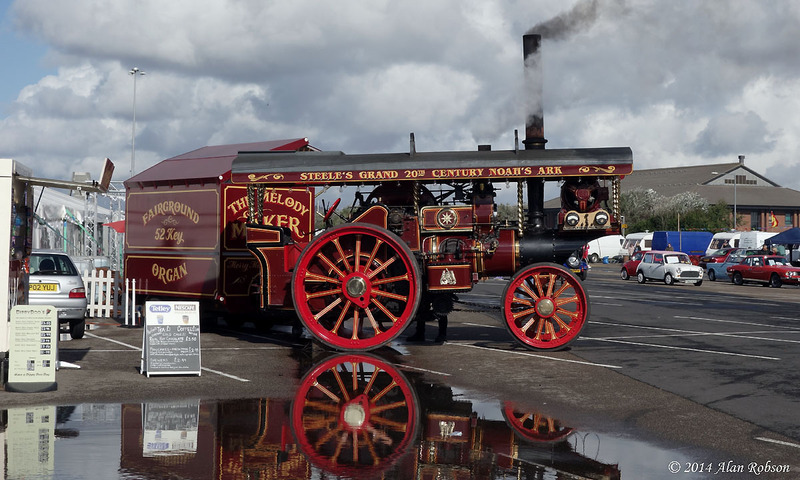 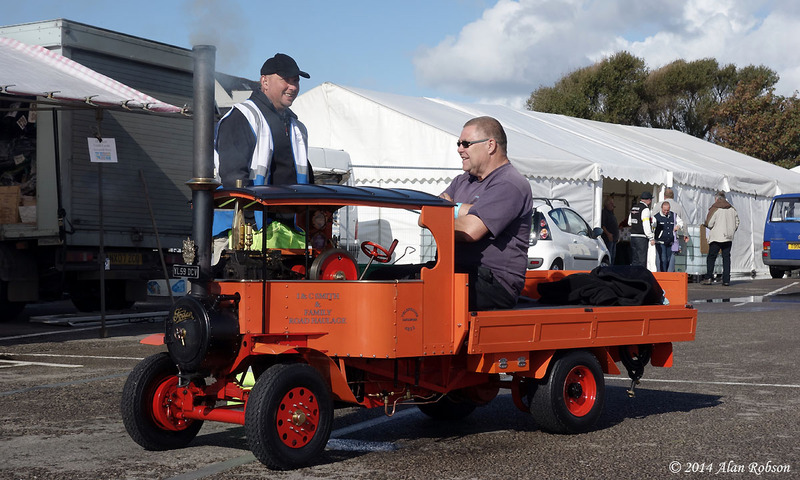 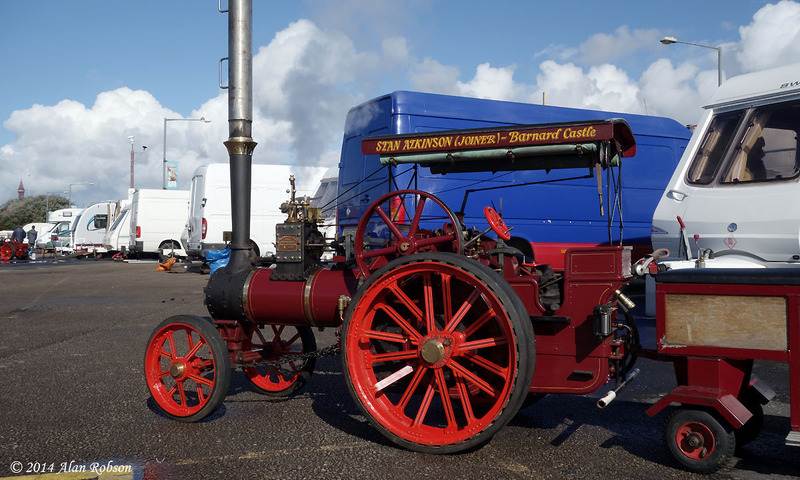 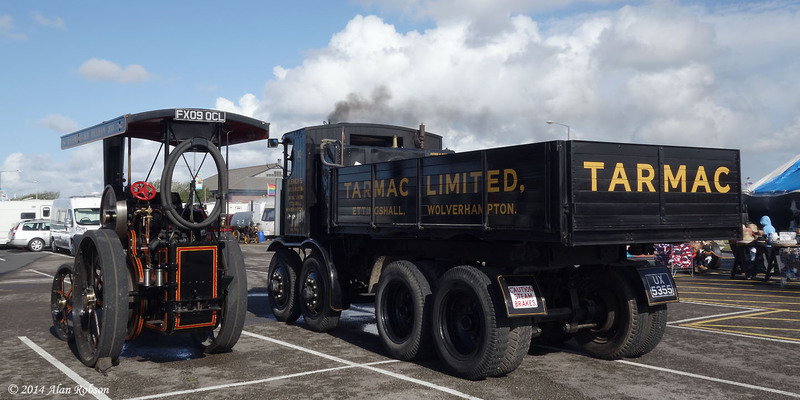 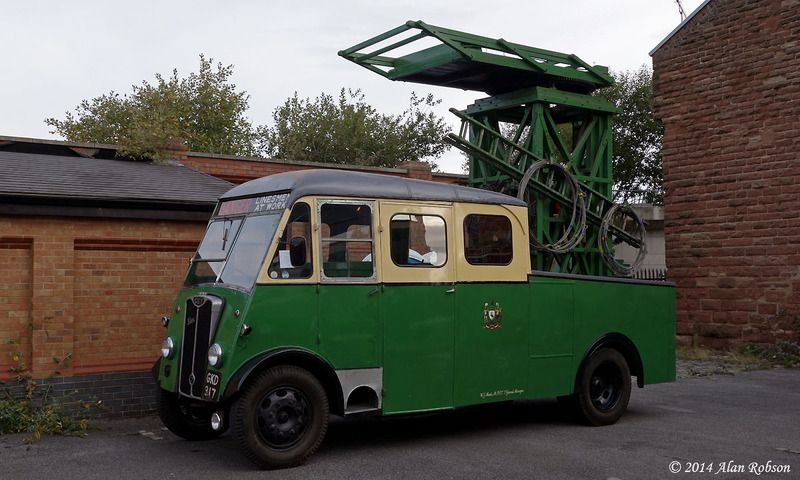 There were a variety of exhibits, ranging from traction engines, fairground organ, steam lorry, miniature traction engines and steam lorries, tractors, commercial vehicles, military vehicles, cars, old motorcycles and static steam engines. 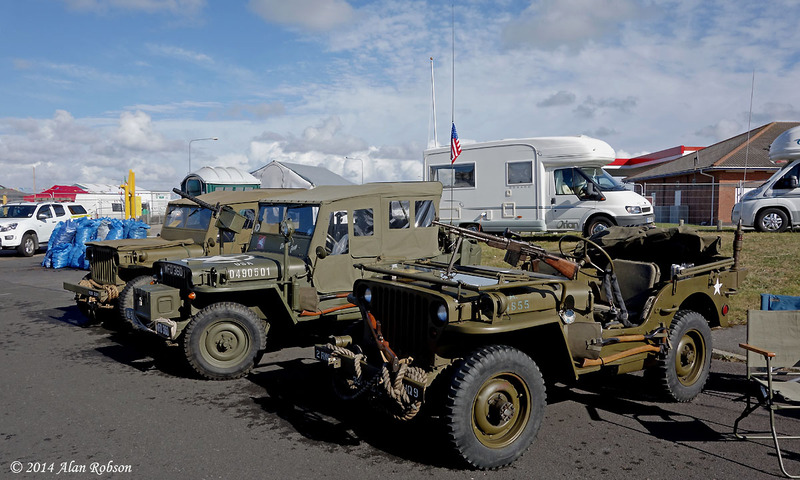 For anybody interested in any of the above, the rally would be well worth a visit if it took place again next year. 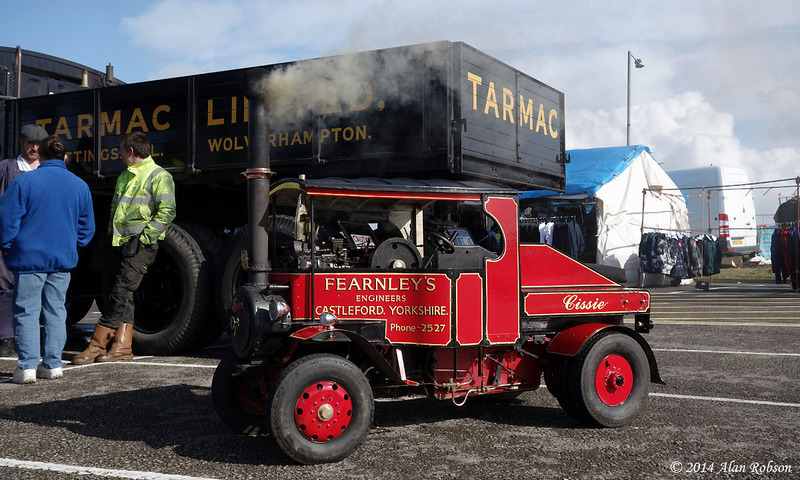 The only niggling drawback was the same affliction which has beset the Heaton Park rally for many years, the lineup of traction engines etc were all parked facing north, so although the Saturday saw plenty of sunshine, it was not possible to photograph the front of the vehicles due to the way they were parked. 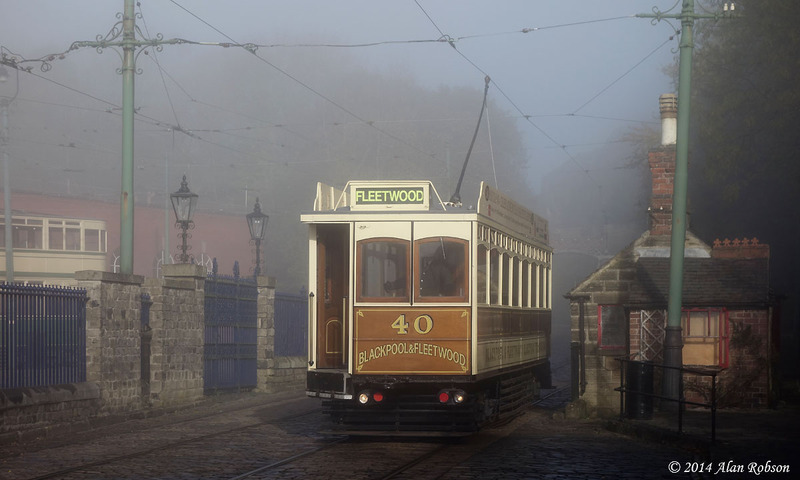 Obviously the organisers of the event like the ones at Heaton Park are not interested in photography! 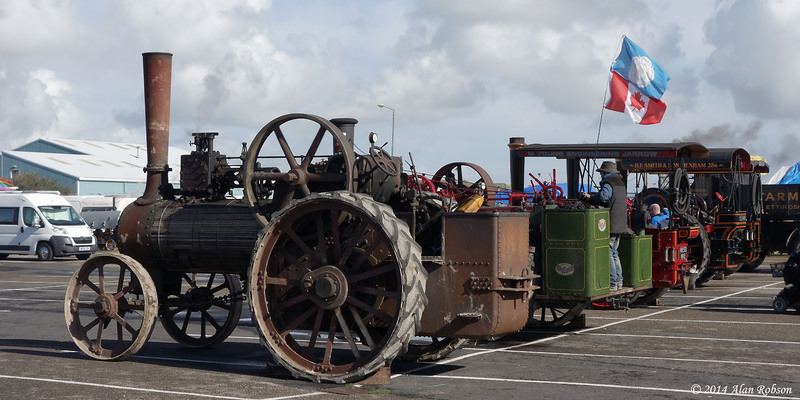 The lineup of traction engines, rather unfortunately parked the wrong way around for photography!